I am among the 1% of people who love liver and onions atop rice. Likely, it was presented to me by my grandmother, the beautiful and willful Rosalie Dial, who wasn’t one to forgive a turned-up nose at dinnertime. Likely, I ate it, agreed it was good, and the rest is history. It’s not something I think about often, but this weekend, it came to mind. I make a batch and freeze everything but the rice for another dinner. It’s also an emotional meal for me because my dearly departed mother, Betty, made me weekly batches while I was pregnant with my two kids and needed boosts of iron to fortify my system (and theirs). When I eat liver and onions, I think of all three of them. Sappy, but true. And so, for you folks whose grandmothers and moms made this and never showed you how, here it is. For you folks who’ve got the curiosity to try it, the recipe couldn’t be simpler. Go for it! Likely, the liver you bring home will be frozen and each slice will be packaged individually. Good. 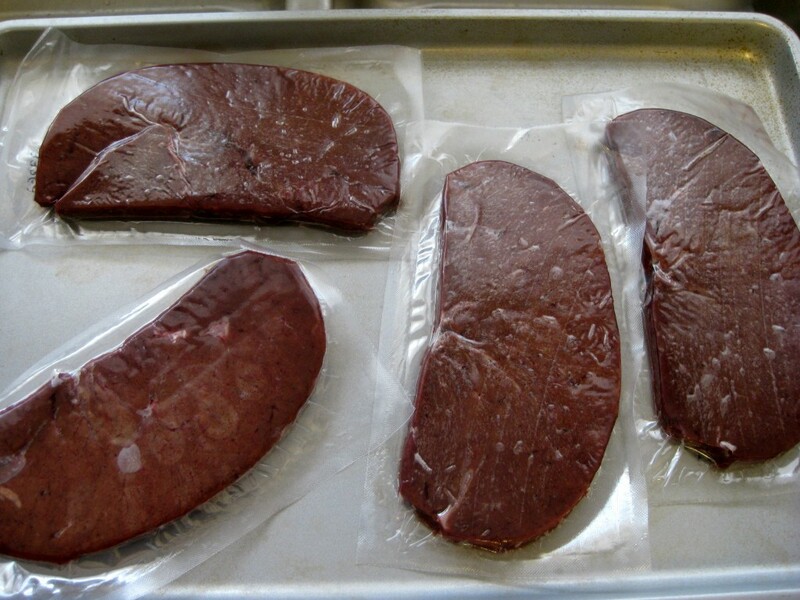 If your liver slices aren’t individually packaged and frozen, rinse off each slice and place them on a medium-sized baking sheet. Stick them in your freezer until they are solid. You want to do this because frozen liver slices are a lot easier to handle then unfrozen, which are very slippery and more likely to tear. Place your dredge dish next to the baking sheet. One at a time, place a liver slice onto the dredge. 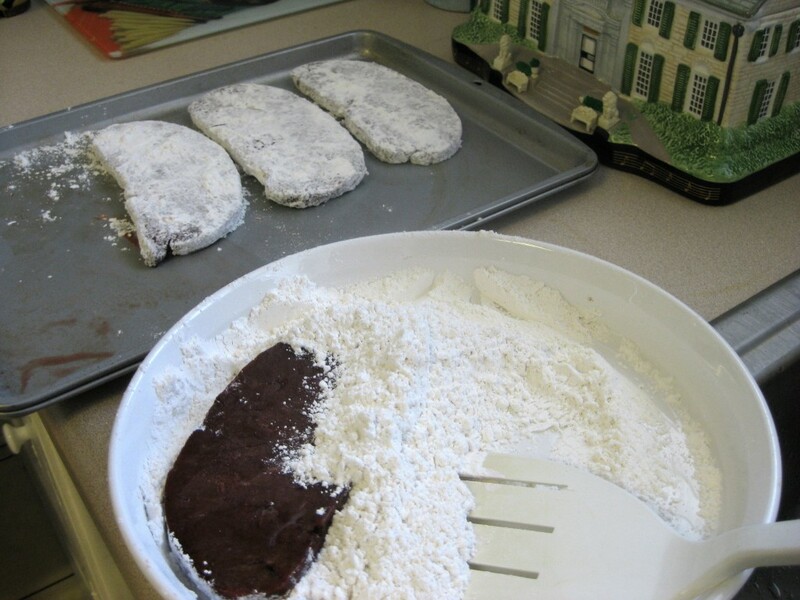 With your spatula or a spoon, heap some dredge atop the slice to adhere for a crust. Flip the slice and repeat. Shake off excess dredge and return the slice to the baking sheet. Repeat until you’ve covered all the slices with dredge. Allow them to rest on the sheet another 15-20 minutes until they’ve thawed and the dredge has gotten a little gooey. 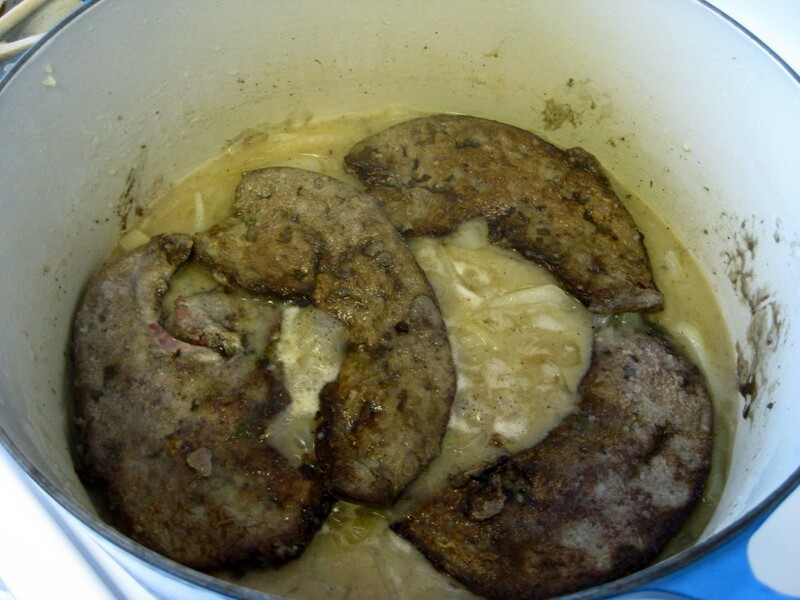 When the liver slices are thawed, heat the Dutch oven on medium-high. Cover the pan bottom about 1/4 inch with olive or vegetable oil, whichever you prefer. Oil will be the proper temperature when it “pops” when you sprinkle a few drops of water into it. 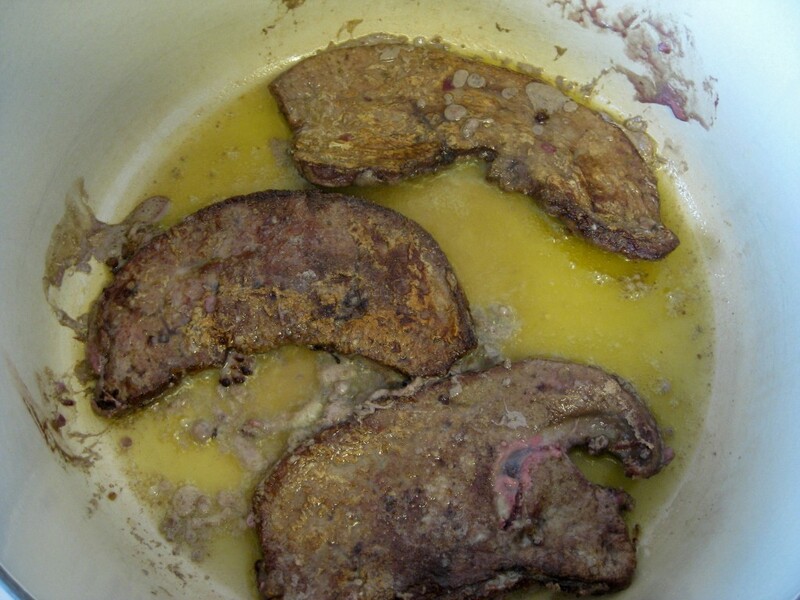 Carefully add liver slices to the hot oil. If your pan isn’t big enough for all four slices, do them two or three at a time. It’s OK if the pieces touch each other, as long as they don’t overlap. After you’ve put the slices into the hot oil, cover and cook for 3 minutes on medium heat. You want to brown them on each side, but lightly or you’ll make them tough. Now turn the slices and cook another 2 minutes uncovered. (It doesn’t matter that the liver may look like it’s not completely done. It will get that way later.) 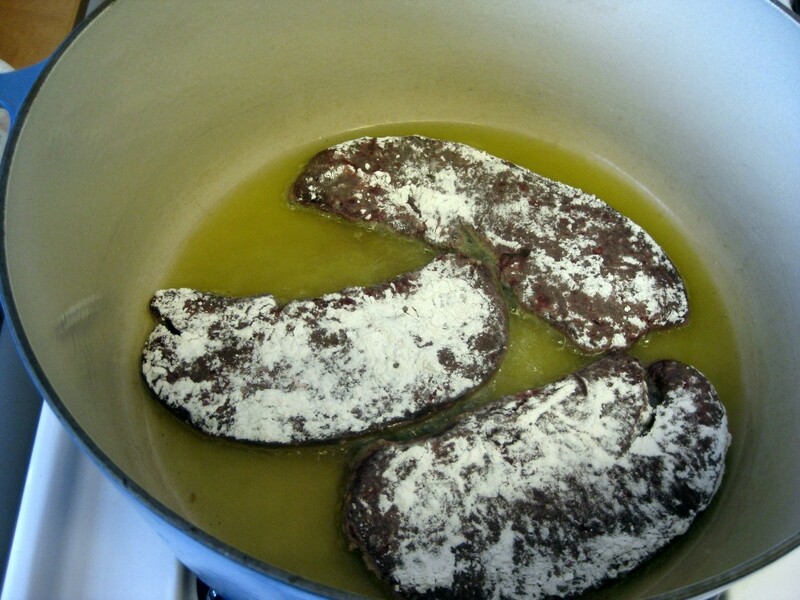 Carefully remove the cooked slices to a large plate to await re-insertion into the Dutch oven. 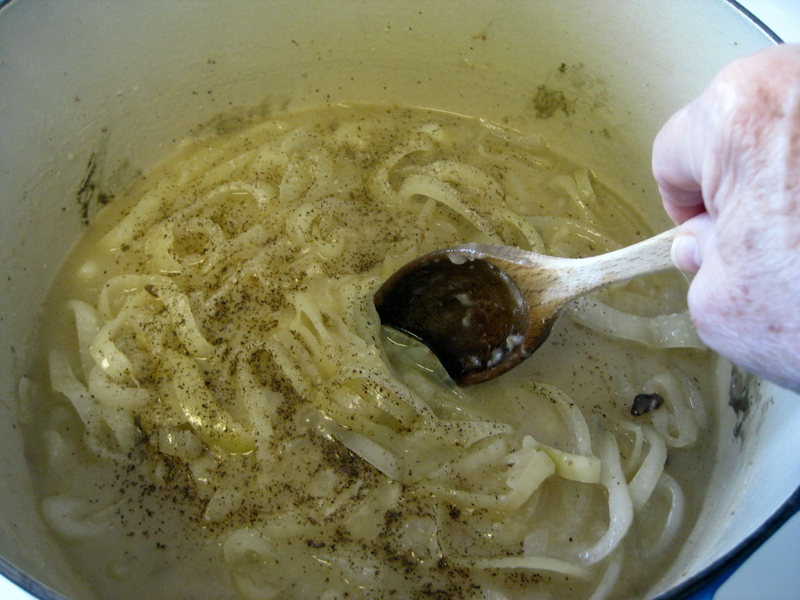 With a wooden spoon, scrape your pan bottom for meat bits, then add sliced onions. 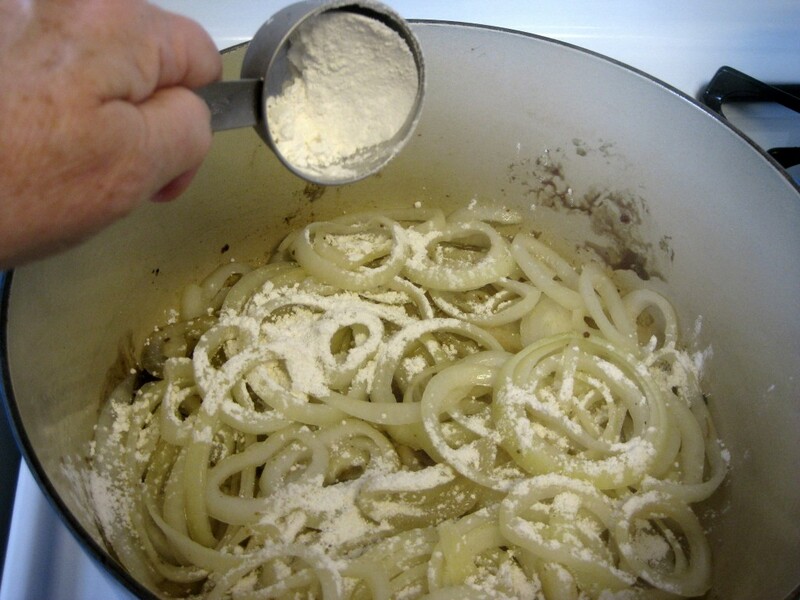 Sprinkle 1/2 teaspoon salt and stir to coat onions with the pan oil. Add 2-3 tablespoons of water to get steam going. Cover and check back in 5 minutes. This is a good time to start your rice. In a sauce pan, add rice, equal amount of water and a teaspoon of salt. Bring rice to a boil, reduce to a simmer, cover and cook 20 minutes. (Do not lift the lid for any reason. If you do, the steam will exit the pan and the rice won’t cook adequately.) After 20 minutes, uncover, fluff rice and turn off the heat. To your onions, add remaining water (about 2 cups) and stir. Taste what’s accumulated on your wooden spoon. Does it need more salt and pepper? (Mine usually does. 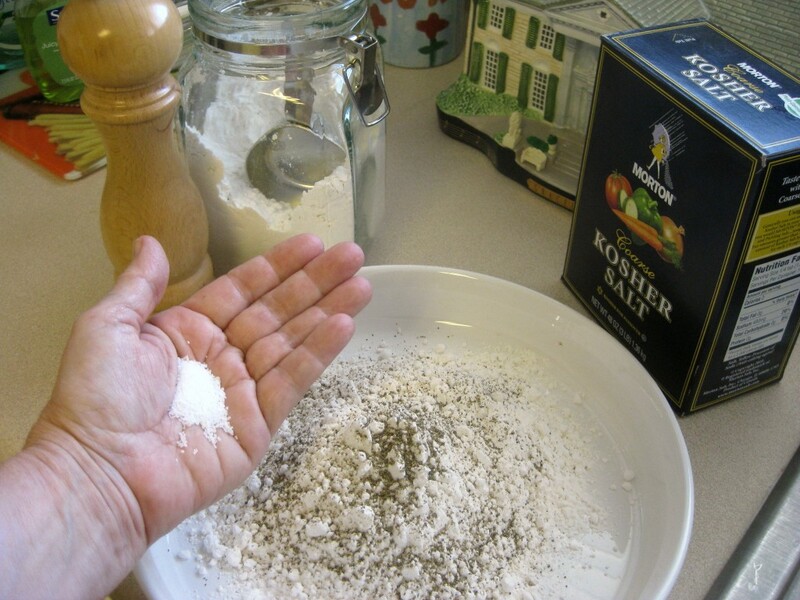 Today, I’ve added 2 teaspoons salt and a generous amount of black pepper. I add it at this stage, rather than load up too heavily in the beginning.) Cook another 15 minutes. (You want your onions nice and wilted, almost “melting” into the gravy.) Place browned liver slices atop the steaming onions. 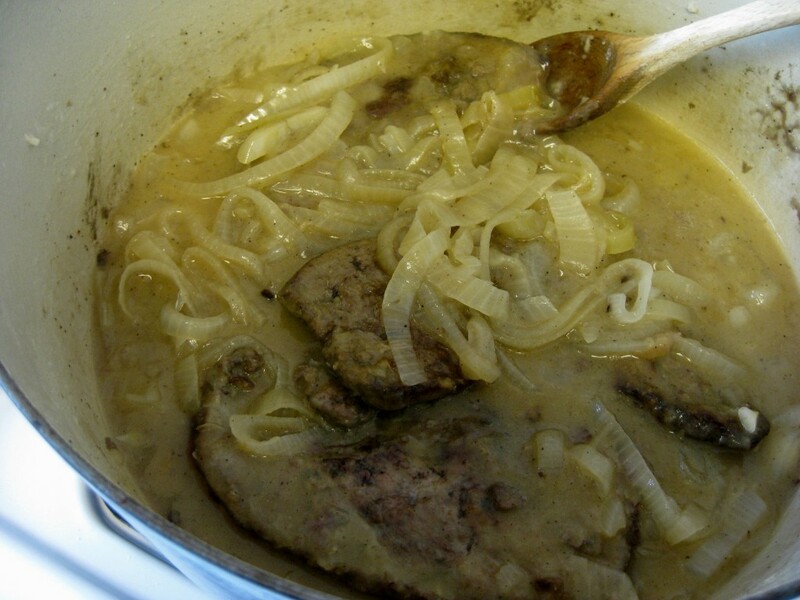 Carefully stir liver slices down into onion-gravy a little bit. Cover and cook on low 15-20 minutes to complete cooking liver. 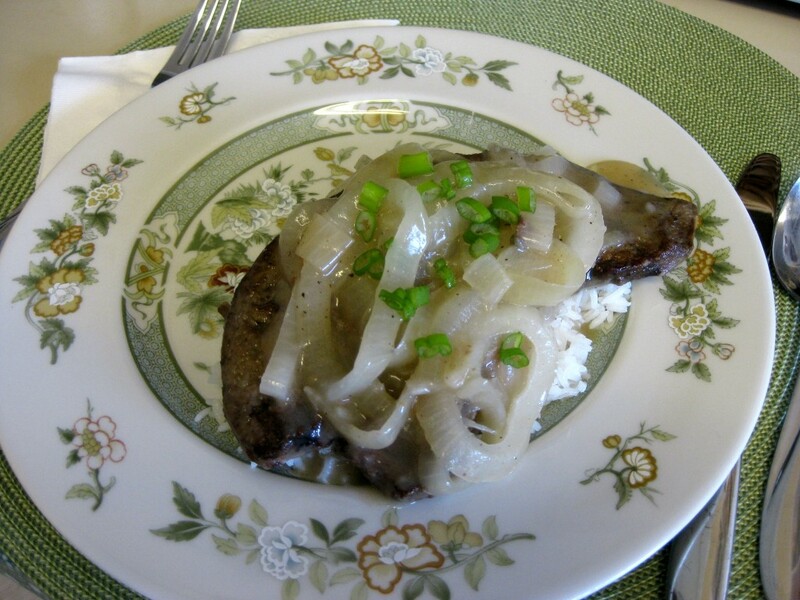 Put generous portion of rice on your plate, then top with liver/onion/gravy. You also might want to garnish with a few green onion slices, just to make it pretty. Serve with your favorite side dish. I like asparagus, beets, carrots, zucchini. Whatever you like. Hot rolls finish with a warm touch. Come back to NewinNOLA.com for “Southfacin’ Cook,” where Patsy explains the basics to Southern cooking and eating. Contact her with suggestions, questions or requests at patsy.brumfield@gmail.com. Click here for previous recipes from Patsy. And here is our complete list of recipes. You are welcome to use these photos under a non-commercial Creative Commons license, as long as you attribute to NewinNOLA.com and link back to the site. This work by Patsy R. Brumfield is licensed under a Creative Commons Attribution-NonCommercial-NoDerivatives 4.0 International License. Previous PostThanks for following @NewinNOLA on Instagram!